More than 40,000 bricks. 110 pounds (50 kilograms). 6.62 feet long (2.02 meters). 4.1 feet wide (1.25 meters). 1.9 feet tall (58 centimeters). Eight months of design and building. Those are the stats for the biggest, most accurate Lego Imperial Star Destroyer ever built. It's truly amazing. 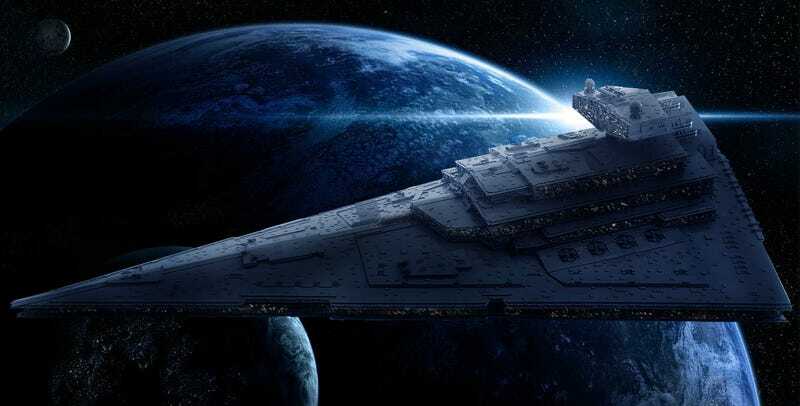 This model of the Chimaera—the Imperial II-class Star Destroyer used by Grand Admiral Thrawn in the Star Wars extended universe—is not only amazing because of its massive size. It's the perfection and accuracy of this Lego machine is one of the most impressive Lego builds I've ever seen. Every single detail was resolved with masterful skill, using a technique called SNOT—or Studs Not On the Top. If you notice, you won't see any of the typical Lego bricks studs. Jerac, a Lego builder from Łódź, Poland, started to design this titanic model on November 11 2013. It was a very complex endeavor, so building actually started on December 28, 2013, ending on June 1, 2014, just two days ago. Check out the intricate work. The imagination he displays in the use some of these pieces is simply incredible. Kudos Jerac!